Check out some of these statistics about Facebook. 67% of B2C and 41% of B2B companies that use Facebook for marketing have acquired a customer through this channel. This makes me wonder: How would it be if a sales rep could use the power of people on Facebook? 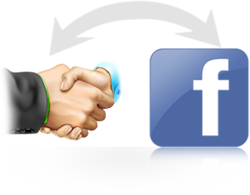 Imagine how much you’d benefit if your CRM account is integrated with Facebook? Zoho CRM now offers an integration with Facebook, thus bringing your customers’ Facebook profiles inside your CRM account itself. You have a lead with you. All you have is the email id. How do you know more about this person before shooting that email? With the ability to associate Facebook profiles, you get most details – like their professional history, designation, schooling, location, etc inside the contact detail page. And with that info, you’re all set to make the follow-up with the prospect a success. A prospect of yours has mentioned about your product in an update. Adding a reply to this comment is possible from the contact’s detail page itself. You not only engage your prospects in a conversation, but also help them get the right answers, right from inside your CRM account. Says Rebecca Lieb in her book, Content Marketing: Think Like a Publisher, “Wall posts create a dialogue with users, friends and fans offering marketers an opportunity to be reactive as well as proactive in terms of content…” This can very well be extended to the sales teams too. The selling process does not end when a prospect ‘buys’ your product. You can be up-to-date with a customer’s updates and even comment or like them without leaving your CRM account. So, the next time you make that call – just to say “Hello” or to talk about a new offer – you know how to keep the conversation going! These are just a few ways in which you could use the Facebook Integration, and we’d like you to tell us more. Do try this out and leave your comments below. We also have an Online Guide to get you started. Facebook and business? That’s something that sounds very well!!! Let’s try it! Thanks folks! I understand that you have to look at a prospect’s profile to know if he posts about our company. What do you think? Are we going to monitor all our clients’ profiles by ourselves? Zoho CRM should bring us the information. In fact, other tools do this already. It woulld be great if It could confirm basico data from Linked in or Facebook. like address or phone number even skype id. and as far as next platform to link too, well. Take your pick. Twitter, Google+, a CRM system should be connected to all popular platforms. Good job!!! Hi Sven,Let me explain, in Zoho CRM, by default for all Administrator profile’s Social Integration will be enabled irrespective of their edition. For free edition, their will not be any edit option for profiles. By default all users will be treated as admin. The implementation of Social Integration is as said above, if the same does not work for your CRM account then please send an email to support(at)zohocrm(dot)com so that we can assist you better. It isn’t all that common that we have an email at the point where we need to look up this kind on information. More often what we have is name, phone and company name. It would find more prospects on Facebook if these were the driving elements used to find a match.Glad to see the integration and hope you consider these suggestions. I am confident others will concur. This is a useful addition although your post is a little optimistic about how much data you could obtain from a prospect; prospects will not share much data with you; even clients may not willing to be Facebook friends with you. This Facebook integration might actually be more valuable with vendors as vendors are more willing to accept your friendship request. But I appreciate your continued efforts to improve CRM. Great idea! Except for one thing.. Since CRM is used for business, we have business emails for contacts and it’s extremely rare that someone will create a Facebook profile with their business emails! It’d be nice to have an advanced search (like the LinkedIn one), to find the person via their names instead of their emails. This is exciting! Good move peeps! Well done, great addition guys. Can you add the same functionality to the Linkedin to add the photo.